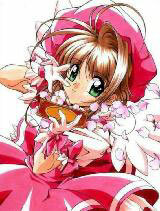 You are going to Watch Cardcaptor Sakura Episode 30 English dubbed online free episodes with HQ / high quality. Stream Anime Cardcaptor Sakura Episode 30 Online English dub Sakura and the Injured Card, When an attempted at capturing the Dash card doesn’t go so well. Sakura’s upperclassman Rei, a girl from the track club, finds it and takes it home. After the Dash enchants Rei to become faster as thanks for her kindness, Sakura has a hard time capturing because she feels bad, but Syaoran doesn’t and one day he finds and luars it to the woods. After Kero and Syaoran tell her that itd’ be worse if Rei won her races through “cheating”, Sakura then captures it. but it goes to Shoran, since he weakened it. During an upcoming tournament, Rei is sad upon the loss of her friend, but Syaoran casts an illusion of the Dash card at the race fields; encouraged, Rei wins without the power of magic.